Burslem, also known as the 'mother town', is one of six towns combined together to form what we know today as Stoke-on-Trent. 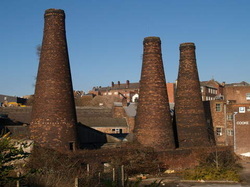 Located in Staffordshire, Burslem has been the most thriving pottery industry since the 12th century. The stone church where Molly Leigh was buried was formed in 1536 and is still in use to this very day. Until the mid-1760’s, Burslem was isolated from the rest of Britain as it had no navigable river nearby and nor were there any good or reliable roads at the time. This is also one of the reasons Molly Leigh was accused of witchcraft, due to the fact that Burslem was separated adjacent towns, it was unaware of religious advancements, therefore they were still inclined to believe in witches. As time progressed so did technology and these factors were no longer a problem and Burslem prospered through the production of fine pottery and canals. Their success led them to the prestigious name of ‘the mother town’ of the six boroughs that made up Stoke. Burslem was granted city status in 1925. Burslem was the home town of Molly Leigh and she is still remembered there today.